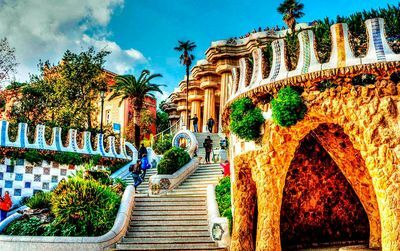 For sun worshippers, Barcelona is just what you’re looking for! It’s coastline stretches for 4.5km and offers the tourists a wide variety of excellent beaches. The most popular beaches among our visitors include Barceloneta, Mar Bella, Nova Icaria and Bogatell. Barceloneta is probably the closest beach to the city and the easiest way to get to this beach is by catching the yellow line metro. Walking from the city takes about 20 minutes. Barceloneta is a wide long beach full of restaurants, which are mostly American style and bars. The Nova Icaria beach is quite close to the Olympic Marina and is full with fantastic beachside bars and restaurants. If you are visiting this beach, make sure the sample the cuisine in Mango and Chiringuito restaurants. Mar Bella Beach is a must for those you like watersports. Here you’ll enjoy the windsurfing, kayaks and hobie cats. Bogatell Beach is actually twice the size of Nova Icaria and is a haven for rollerbladers, cyclists and joggers. This is a more tranquil area and does not have a lot of bars and restaurants. All the Barcelona beaches are kitted out people with disabilities, sun beds and lifeguards and all the beaches are well maintained. Considered as being the last stretch of the beach of La Barceloneta. There are all types of facilities: showers, lifeguards, bars, as well as good disabled access. Located between the beaches of Nova Mar Bella and Bogatell. There is a sports centre very near the beach. The Promenade stretches as far as the beach of la Barceloneta. Good for windsurfing on windy days. The Mar Bella beach has a designated nudist beach area screened by a long hillock of bamboo and is mostly frequented by young people. This beach is very close to the Olympic Port and is separated from the other two beaches with similar characteristics by two stone breakwaters. It has a lifeguard service, showers, ramps to take you on to the beach, bars, restaurants, parking, etc. The promenade runs until Sant Sebastiá Beach, in the Barceloneta district. The beach on the other side of the Olympic Port. Separated from Barceloneta Beach by a breakwater. There is a lifeguard post, table tennis tables, children's playground and a half-pipe for skaters. The beach is very wide and goes right up to the promenade. 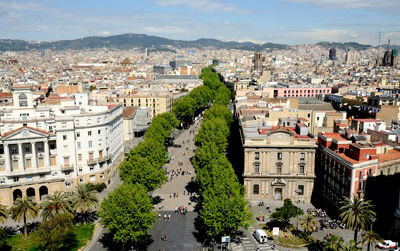 Its promenade runs until the famous district of Barceloneta. This is the women's favourite beach, exceeding 60% of total users. A very good beach with a variety of services, such as showers, lifeguard service, bars and parking. Easy access via ramps. 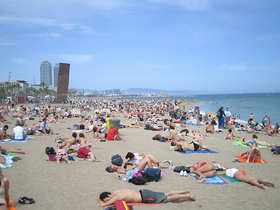 It is the beach which is next to the Barcelona Olympic Port. The promenade runs until the Barceloneta district. Near the beach there is an esplanade with stone benches for contemplating the landscape. It is considered one of the quietest in the city, frequented mostly by families with children. Stretching out along the entire promenade up to the Olympic port in the renowned and old maritime neighbourhood of the same name. There are all types of services typical to a town beach. This excellent beach has two beaches one at each end: one near the Olympic Port with Paseo Marítimo Beach and the other near the Puerto de Barcelona with San Sebastiá Beach. These beaches have a big team of patrolling lifeguards from the local police, particularly in the summer season. It is a favourite amongst our foreign visitors. 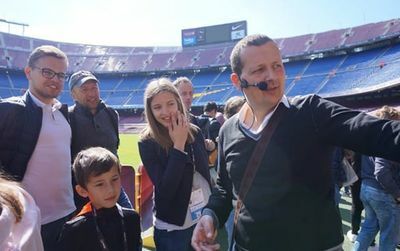 The Barcelona beach season usually goes between March 15th and November 15th when all installations and facilities are dismanteled, being the high season from 31st May to 28th September. les porcs qui fréquentent la plage de la Barceloneta la laisse dans un état pitoyable : bouteilles de bière, bouteilles d'eau, verres en plastiques, sacs plastiques, mégots... tout cela dans des proportions hallucinantes ! if you want enjoying beaches in barcelona, avoid to go there with your car, especially if your car is not spanish one. Unfortunately, there are lot of thieves who are practicing their racket with violence, by breaking car glasses. what is amazing, is that these thieves are acting at an open place, in afternoon, where many people are moving...but no one is there to stop them. these thieves look like uncatchable!! No pictures have been displayed to inform visitors about that risk. it is a shame!! many great chiringuitos on barcelona's beach. a good thing to do. Great time in a little chiringuito on the beach of Barcelona. They played cool music and serve great drinks. What a day! Barcelona beach is one of the best enjoyment place in this world.But enjoy is not life. 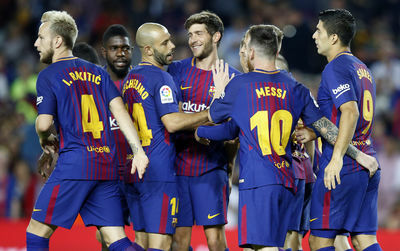 Barca Para Siempre,Para Siempre Barca ! ! !